CHAUMET has received many distinct accolades including “238 years of history”, “the jeweler of Napoleon”, “rich artistic heritage” and “exquisite craftsmanship”. How can a luxury brand with such a deep heritage further discover its potential and inspire superior commercial performance? Within the LVMH group, CHAUMET holds the longest history out of all of the jewelry brands. Its market development in China is a tipping point to reinterpret its beauty and brand story. Luxe.Co had an exclusive interview with Jean-Marc Mansvelt, global CEO of CHAUMET, who shared his insights on invigorating this historical luxury brand. How can one balance heritage and innovation, classic and modern? In China’s luxury goods market, should brands rush to get in or wait until a certain maturity develops? How can one tell a touching brand story and impress increasingly sophisticated Chinese customers effectively? How does one create new content, find new interpreters and new ways to deliver the story? Mr. Mansvelt joined CHAUMET as its global CEO in January 2015. Since then, CHAUMET has added more interesting and dynamic elements to its elegant style in the Chinese market. In addition to diversified marketing activities and high-profile art exhibitions, CHAUMET has achieved outstanding sales performance. Mr. Mansvelt described CHAUMET as a “sleeping beauty”. The key is to “awaken” her deep cultural values and allow the world to discover her charms and stories. Founded in 1780, CHAUMET is high-jewelry and watch house in France. It is the only designated historical jewelry specialist for Louvre Museum in Paris. Its founder, Marie-Étienne Nitot, was the official jeweler to French Emperor Napoleon Bonaparte and crafted the fine jewels of the coronation crown of Queen Joséphine and Napoleon. Queen Mary Louise, Napoleon III and many European royals and nobles are core clients of CHAUMET. CHAUMET entered the Chinese market rather late, though its history stretches far longer than other luxury jewelry brands including Cartier, Tiffany and Bulgari, which have become familiar names for Chinese consumers. Cartier came to China in 1992 as one of the first luxury jewelry brands to enter the Chinese market, and played an important role in the development of Chinese luxury goods market. Tiffany and Bulgari arrived in China in 2001 and 2003, respectively. CHAUMET missed the first luxury brand consumer education period in the 1990s. Its communications in the Chinese market were relatively low-key. Although CHAUMET is a fully equipped and outstanding luxury brand, it had developed slowly in China. By 2007, CHAUMET had become familiar with the Chinese market. Competition between luxury products had also become increasingly intensive. While CHAUMET opened its first mainland China store in Shanghai, Cartier had plans to increase their presence to 22 mainland stores and begin expanding to second-tiered Chinese cities in 2008. Admittedly, early birds and proactive marketers enjoy an advantage in market performance and brand awareness in a relatively blank market. However, the market, consumers and environment are constantly evolving. According to the 2017 report on China Luxury Market Research released by Bain & Company, Millennials are becoming the main driving force in China’s luxury market, choosing to pursue individuality rather than simply luxury. With the constantly evolving market environment, the question of how to balance heritage and innovation has become a new challenge and opportunity for participating luxury brands. A strategy of developing slowly in a fast-moving environment may be a breakthrough for new opportunities. Only through association with the present can history and heritage develop real market value. Mr. Mansvelt is an expert in this. Previously, he was responsible for the marketing of the high-end products at L’Oréal Group, in charge of brand creativity and the development of new concept consumer goods. Mr. Mansvelt joined the LVMH group in 2004. He established and launched Louis Vuitton’s stationery collection, “Writing Universe”. He also formed the Perfume Business Department, Market Information Department and Accessories Department. The main theme of his work was to achieve the breakthrough and innovation in inheritance. Mr. Mansvelt is very experienced at extracting and redefining luxury lore from the long history of luxury brands. In other words, Mr. Mansvelt has been depicting the story of CHAUMET with updated content, different ways of interpretation, and new narrators in a fresh round of marketing campaigns in order to gradually awaken the “Sleeping Beauty”. In one of the new campaign images of CHAUMET in 2018, the crown is worn backwards by the model, a hand in a white glove appearing from the window wearing four Joséphine collection diamond rings forming a new “crown shape”. The images pay tribute to the brand’s heritage while also looking fun. In another image, the glittering Liens collection bracelet is worn creatively on an ankle with skirt and high heels. 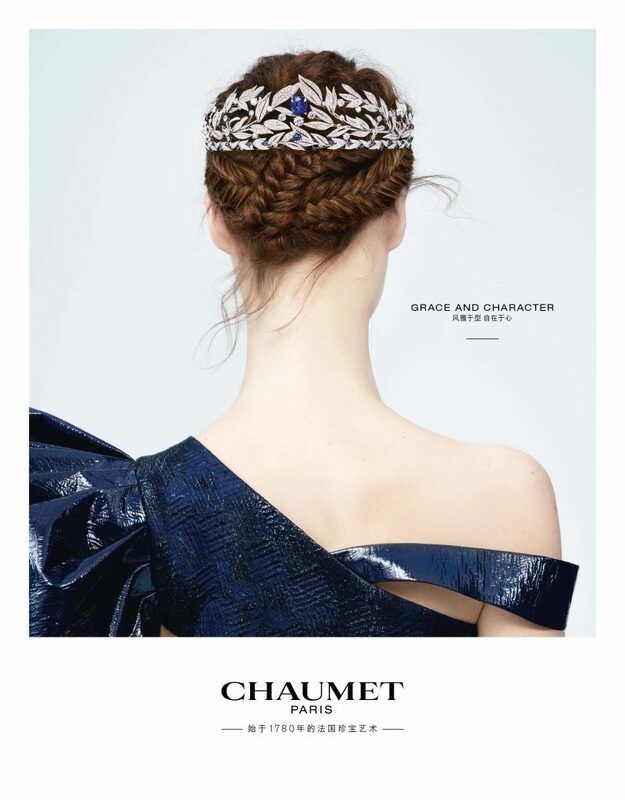 CHAUMET wishes to emphasize its concepts of “uniqueness” and “breaking the rules”. As the “Crown Master” recognized by the luxury industry, CHAUMET has created nearly 3000 crowns, which are its signature core product. But this pure aristocratic lineage is also an invisible “restriction”, as CHAUMET’s traditional jewels are more ritualistic for special occasions. In 2012, CHAUMET hosted the first “May Ball” in Shanghai, bringing the aristocratic tradition of the 16-year-old ladies social event, originating in the UK, to China. This provided a social scene for CHAUMET’s crown jewels. In order to further reduce the distance between ritualistic and occasional jewels, CHAUMET utilized 2018 campaign images as a channel for reinterpretation. In addition to CHAUMET’s iconic images of elegance and style, the campaign mixed in the concept of freedom. True luxury is about the free state of the heart, not restraints from outside. This reflects the brand manifesto: “Grace & Character”. The new campaign image in 2018 is a clash of tradition and innovation. “CHAUMET utilized its rich history to nourish a contemporary brand image.” said Mr. Mansvelt. Nowadays, young consumers pursue individuality and fun. CHAUMET intends to change “the sense of occasion” for wearing jewelry to emphasize using accessory jewelry in daily life through its new marketing campaign. Nowadays, many celebrities choose to wear CHAUMET as accessories, no longer limited to ceremonies, weddings and other special occasions. Chinese female celebrities including Shishi Liu, Shuying Jiang, Mi Yang and Sui He have chosen to overlay CHAUMET jewelry in their street snapshots. Their looks are casual and relaxed, while accessorizing and overlaying with necklaces, rings, bracelets from different CHAUMET collections. Fashion is effortless, elegant and fun. “We are constantly innovating in jewelry design. But we will never forget our history and heritage. We will always maintain a balance between tradition and innovation, ” said Mr. Mansvelt. Jewelry brands are not fashion brands. CHAUMET’s creative design will not simply follow trends. They will be timeless, a collection of a lifetime. Regarding the balance between classic and fashionable, Mr. Mansvelt stated that CHAUMET would abide strictly and clearly to the brand’s historical heritage. Who to tell brand stories? While foreign luxury brands develop in China’s market and increase brand awareness, they usually choose to collaborate with popular local celebrities. In 2017, numerous luxury brands had sponsored celebrity endorsements and brand ambassadors. CHAUMET collaborated with many local celebrities such as Yuanyuan Gao, Yifei Liu, Yixing Zhang to attract more attention to their campaign. Mr. Mansvelt emphasized that CHAUMET did not invite any celebrities to be the spokesperson for the brand. Celebrities chose CHAUMET because they appreciated the brand’s innovative spirit and uniqueness. This is why many local celebrities become part of the CHAUMET family. In CHAUMET’s view, the true spokesperson for the brand are CHAUMET’s clients, with the purity of French nobility, history, art, and distinctive Parisian style sprinkled in. CHAUMET originated from the love story of Napoleon and Joséphine with three jewelry collections, Joséphine, Liens and Jardins, representing love and beauty. One of the most important features of luxury marketing is to transform history and legend into touching contemporary “real dreams”. Therefore, it is necessary to replace the previous roles of “king, queen and countess” with modern characters to reinterpret the love story. In this case, celebrity weddings are the contemporary fairy tale. For most luxury jewelry brands, weddings are an important opportunity to influence potential loyal customers. Mr. Mansvelt mentioned that many young customers come to CHAUMET for the first time when they are about to become get married. From here, they begin their journey in the world of CHAUMET jewelry and become loyal customers. In recent years, CHAUMET has frequently been present in the weddings of many Chinese celebrities, including Yuanyuan Gao and Mark Zhao, Jay Chou and Ling Kun, and Xiaoming Huang and Angelababy Yang, all of whom chose to adorn CHAUMET’s full set of jewelry and wedding rings. How are Brand Stories Delivered? 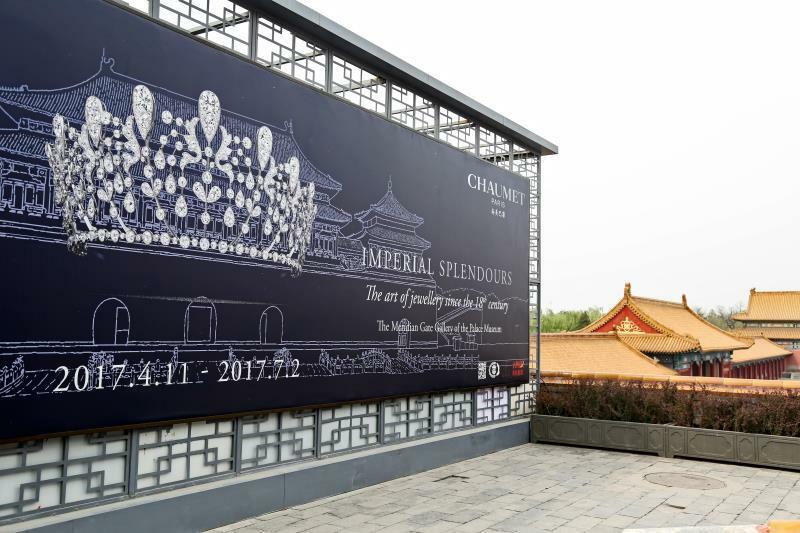 In April 2017, CHAUMET launched the exhibition “Imperial Splendors – The Art of Jewelry Since the 18th Century” in the Forbidden City in Beijing, where in-depth stories about CHAUMET gradually unfolded to Chinese consumers. Mr. Mansvelt believes that the foundation of modernization was based on historical and cultural heritage. To explore and share CHAUMET’s origins and stories through exhibitions is a means of aiding the development of society. The former CEO of Hermès emphasized the function of stores in promoting luxury brands. An outstanding single-brand store is an effective way to deliver brand stories, emotions and dreams. It is also a perfect place to interpret the story, and hold intimate communication with clients. CHAUMET’s flagship store and museum are located in the heart of Place Vendome in Paris. In Mr. Mansvelt’s view, to further interpret CHAUMET’s brand story in China, new architectural language is important. In July 2018, CHAUMET opened a premium boutique with a new image at WF Central in Beijing. Jean-marc Mansvelt described the store in detail. Every visitor stepping into CHAUMET’s premium boutique will be greeted by the signature royal blue CHAUMET logo, a classic crown and many iconic brand symbols, such as wheat. These details reflect the charms of the brand. Currently, CHAUMET has opened 18 premium boutiques in 14 cities in China, including in Beijing, Shanghai, Chengdu and Hangzhou. A well-known Chinese WeChat official account published an article in 2015, “Queen’s Attitude”. The article triggered a social media wave with a huge number of reposts, and became a classic case study of social media marketing. This article interpreted CHAUMET’s story as the “Crown Master”. After entering the China’s market in 2007, CHAUMET’s communication has mostly come in the form of new store openings, its May Ball and celebrity accessorizing with a mild and traditional approach. After Mr. Mansvelt took over the position of global CEO in 2015, CHAUMET’s marketing communication in China has become more active. CHAUMET has become more visible and diversified in social media. During CHAUMET’s 3-month exhibition at the Forbidden City, the topic #China-France Treasures Art Exhibition# received 120 million hits with 750,000 comments. In addition, CHAUMET invited many opinion leaders from arts, culture and design fields to visit the exhibition and to promote it through their social media accounts.